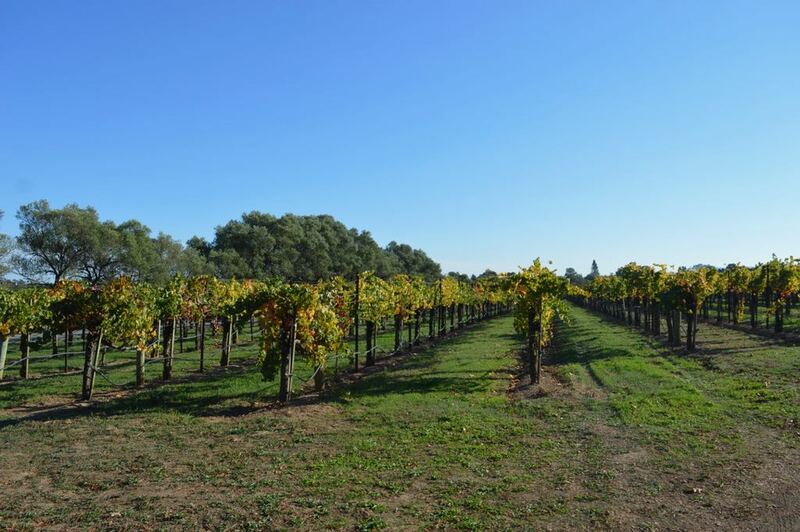 We heard Sonoma was the more laid-back area of wine country and decided laid-back plus wine sounded perfect to us! We adjusted our route to stop in Sonoma on our way to San Francisco. It was a welcome detour from the coastal cloudy weather we’d been experiencing. Our first stop was exploring downtown Sonoma and Sonoma State Historic Park. Fun fact, this park was the birthplace of the California State Bear Flag. 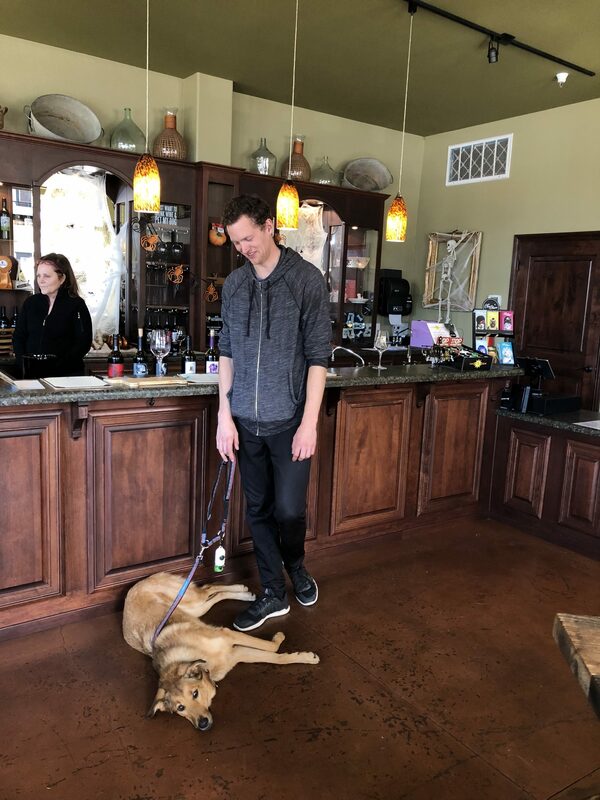 After a little history we stopped at two wineries’, selected solely based on that fact that they were dog friendly. The first winery we stopped at was called Mutt Lynch and had a tasting room in Windsor, Sonoma County. They created a dog treat charcuterie board for Roo! All their wines had creative dog related names, including a couple labelled “mbf” for man’s best friend. They even have a wine where a portion of the proceeds go to the local animal shelter. It was our kind of place! We ended up getting the “mbf” 2015 Primitivo (somewhat similar to a Zinfandel). Both Mitchell and I really enjoyed it! It’s a good thing we have limited storage space (and budget) otherwise we probably would have ended up with a few more bottles for the road. Nothing beats being outdoors, but a nice glass of wine sure does enhance it. 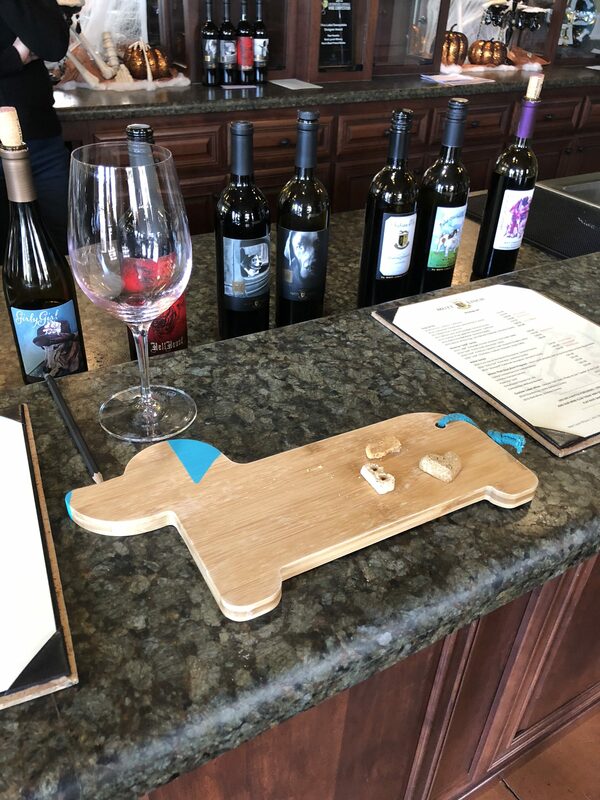 We saved our Mutt Lynch wine purchase for our one month on the road celebration! Roo’s half eaten dog treat charcuterie board. The second winery we stopped at was the Pellegrini Winery and Vineyards. We were able to take in the sun on their outdoor patio which also served as their tasting area. I am always impressed by the details and intricacies that go into making each vintage and only wish I could remember everything we learnt! This winery is in the Russian River Valley area of Sonoma County and this area is known for Chardonnay and Pinot Noir, as not a super discerning wine connoisseur all I can tell you is we had tasted some really great wine and ended up finding space to store more wine in the back of the truck. Priorities. 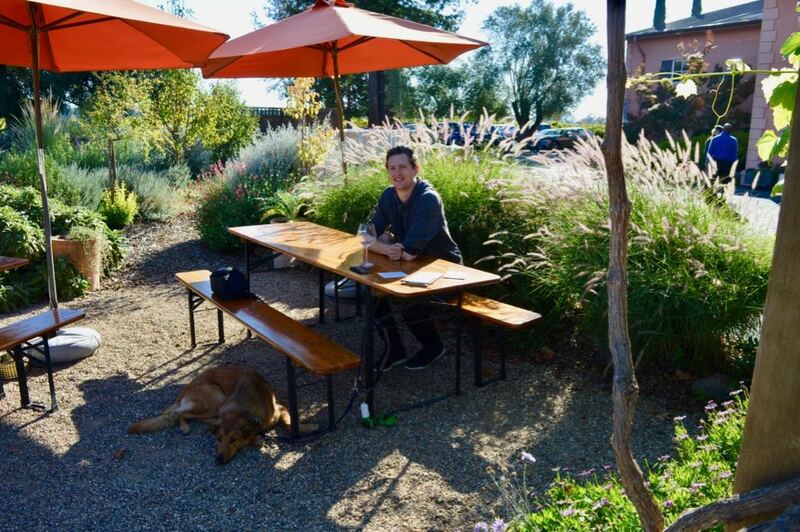 The lovely dog friendly outdoor tasting area at Pellegrini Vineyards. We have also decided wine really does taste best in glass and splurged on two stemless wine glasses so we could make sure we really enjoyed our wine purchases. This is the only glass we have in our kitchen supplies… we’re feeling pretty fancy now. After our brief tour of Sonoma Valley, we headed towards San Francisco. We found a great campground at Anthony Chabot State Park which was only 45 minutes outside of San Francisco. With the crazy high prices for everything near San Francisco I am pretty sure this campground was a huge win at $28/night. 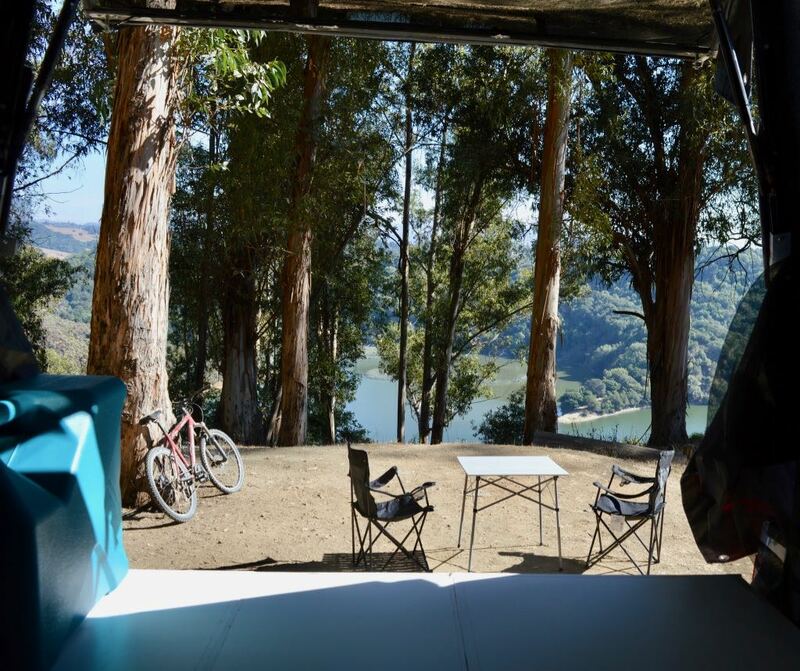 This included unlimited hot showers and amazing views of Chabot Lake. View from the truck bed at our campsite. Mitchell had never been to the Bay Area so we used the Anthony Chabot Campground as a base for exploring the area. The company I previously worked at is headquarter in San Francisco so while it was fun exploring the area it was also a great opportunity to catch up with old co-workers! 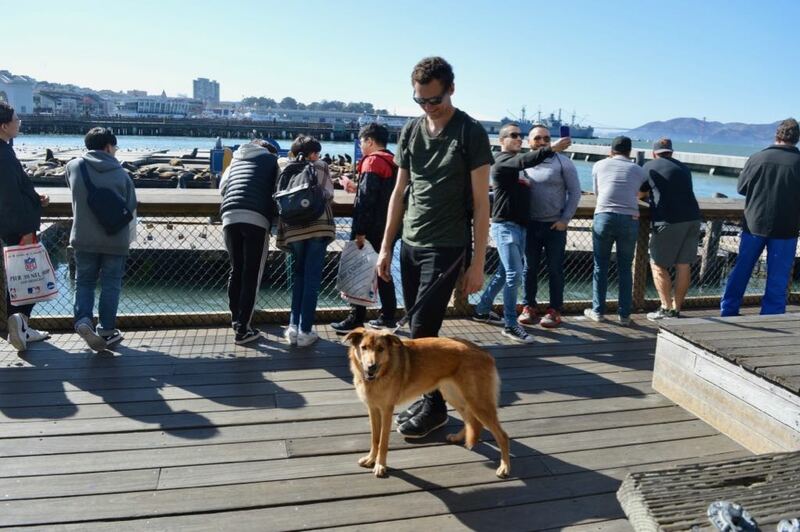 Roo checking out the seals at Pier 39. Roo was a trooper and toured all around Fisherman Wharf and Pier 39. 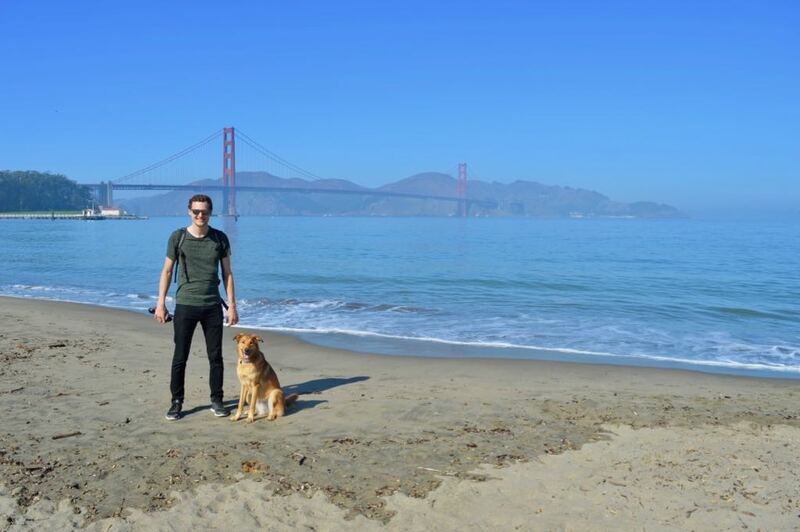 In downtown San Francisco there is a dog friendly beach and park called Chrissy Fields. I visited the area on a business trip almost a year ago and remember thinking if we do ever make this trip happen I am sure Roo would love it here. Happiness is dogs running and playing on a beach. Now’s she been and I think I can safely say she had a blast. Sitting with Mitchell and Roo on the beach where I sat a year before thinking about the challenges associated with the work week ahead makes me laugh a little at how different life is now. We still face challenges but of a new variety, largely centred around living out of a truck on the road. Hi! Yes, we think Roo has been getting better a posing too! She now finds rocks to climb up on and looks at us expectantly waiting for her photo. Hope all is well!